Is Cantor going 'rogue' or sticking to principles? House Majority Leader Eric Cantor is strongly against any tax hike when it comes to a debt ceiling deal. Washington (CNN) -- House Majority Leader Eric Cantor has been a thorn in Democrats' side when it comes to the debt ceiling talks. He has shown an unwillingness, critics argue, to agree to a deal that includes both spending cuts and raising revenue through tax loopholes -- two things Obama has called for. Democrats have taken note and have been quick to portray Cantor as the bad guy in the debt stalemate. On the Senate floor Thursday, Senate Majority Leader Harry Reid said Cantor has "shown he shouldn't even be at the table and Republicans agree he shouldn't be at the table." His colleague Sen. Chuck Schumer, D-New York, said Cantor is "standing in the way and it's a shame." "I believe in their own ways all the other Republicans around that table have tried to be a constructive force from time to time. I haven't seen ... Cantor be a constructive force thus far," he said. Cantor, however, said he is sticking to his principles. "And the fact is, we are gonna abide by our principles and that's how it is," he told reporters Thursday. "And I'm sure the speaker joins me in that." In a 2009 interview, Cantor said one of the reasons the Republican Party fell from power in the 2006 and 2008 elections was that "our fiscal credentials just fell apart." What if the U.S. reaches debt limit? McConnell debt plan a 'bad' idea? "Most people expect the Republican Party to be one of of fiscal prudence, limited government, lower taxes and less spending. And on that spending issue, clearly the bar wasn't met and the expectation was that we would have been a much more fiscally conservative crowd." A return to a fiscally responsible party is in large part what helped the GOP take control of the House in the 2010 midterm elections. After the election, Cantor was elected as House majority leader. The GOP leader has often been see as a rising star in the party -- even mentioned in 2008 as a possible vice presidential candidate. 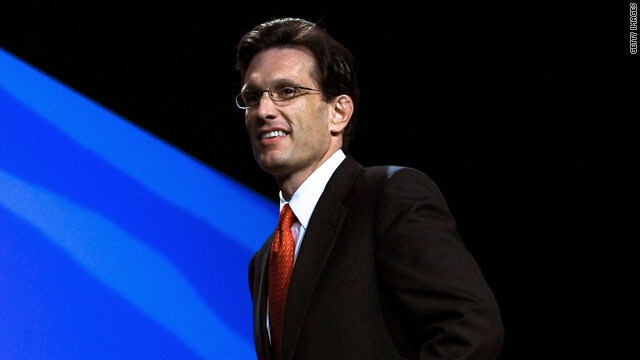 Cantor at the time issued a warning to Republicans after the party's takeover, saying in a CNN interview that this "is a second chance for us. If we blow it again, we will be in the wilderness for a very long time. We have to deliver." As debt negotiations stall, Cantor has seemingly stepped up as a top negotiator for the Republican Party. The Virginia Republican, who has served the people of the state's 7th congressional District since 2001, is certainly not afraid of taking on the president. Negotiations broke down Wednesday night after a tense exchange between the president and Cantor. He later told reporters that he proposed a short-term agreement to raise the federal debt ceiling, a position Obama has previously rejected. Administration officials and economists have warned that a failure to raise the current $14.3 trillion debt ceiling by August 2 could trigger a partial government default. If Washington lacks the money to pay its bills, interest rates could skyrocket and the value of the dollar could decline, among other things. Cantor, who wants a series of short term raises and no new taxes, has sometimes been at odds over what others in the leadership want. House Speaker John Boehner, R-Ohio, often characterized as the deal maker, has shown some willingness to pass a grand debt deal. Senate Minority Leader Mitch McConnell, R-Kentucky, even proposed a plan which would give the president the ability to raise the debt ceiling, although that plan would require politically risky votes before the 2012 election. Each and every time, Cantor has fought back, leading some political observers to believe the Republican Party is "leaderless." Washington Post columnist Dana Milbank told CNN Thursday that Cantor has gone "rogue from the leadership but in the sense that he has a large amount of the caucus behind him." "In fact, John Boehner started to talk about a grand bargain -- he immediately gets undercut by Cantor and the next in line, Kevin McCarthy," Milbank said. "So it's almost a leaderless position here." Boehner and Cantor fired back at critics who argue there is a rift developing within the leadership. "We (Boehner and Cantor) have been in this fight together and any suggestion about the role that Eric (Cantor) has played in these meetings has been anything less than helpful is just wrong," Boehner said Thursday. "I am glad Eric's there and those who have other opinions can keep them to themselves." Cantor said "the speaker and I have consistently been on the same page." And that rank and file includes tea party-backed House members, such as presidential candidate Michele Bachmann. Tea party groups are dead-set against any deal that raises taxes -- even if it is through cutting tax loopholes. "The tea party members, or those sympathetic to the tea party, really control this. And they're dominant within that caucus right now. Nobody wants to go up against them; they're fearful of that," he said referring to Cantor and other leaders. Cantor has been a strong supporter of the tea party movement. He has a long track record of supporting fiscally conservative positions -- including a pledge to not raise taxes. John Avlon, author of the book "Wingnuts" and a CNN contributor, said that Cantor's opposition Obama's plan to raise revenue through ending tax loopholes is out of touch. "But when Republican House Majority Leader Eric Cantor redefines closing tax loopholes as tax increases because simplifying the code could raise revenue, he makes a mockery of the whole concept," Avlon wrote in a CNN.com commentary. "His insistence that tax loophole closures be essentially deficit neutral ignores the entire reason we are embarking on this forced fire drill: to reduce the deficit." Unlike Cantor, the American public appears to support tax hikes for wealthy Americans. A Quinnipiac University poll out Thursday finds 67% of the public say an agreement to raise the debt limit should include tax hikes for wealthy Americans and corporations, not just spending cuts. The poll's release comes as the president and top congressional leaders from both parties get ready to meet at the White House for a fifth straight day to try and head off a possible federal government default. Democrats, for their part, are taking on Cantor, even digging up his past. The Democratic Congressional Campaign Committee sent out a press release Wednesday that mentioned Cantor's nickname from his time in the Virginia General Assembly was "Overdog." "True to his roots, he got the nickname 'Overdog' for his unflinching support of big corporations and the wealthy at the expense of the middle class," the press release read. Meanwhile, Schumer said in a Twitter post this week that Cantor and the GOP have "talked a lot about need to reduce debt but every time negotiations get close, they run away." In late June, Cantor withdrew from the negotiations spearheaded by Vice President Joe Biden, saying they had reached an impasse with Democrats over tax issues and it was time for Obama to get involved to broker a deal that would pave the way for a vote to raise the debt ceiling this summer. The bipartisan group had been meeting for weeks behind closed doors to discuss various proposals to cut spending, from both discretionary programs and entitlement programs, such as Medicare. Multiple Democratic sources claim Cantor backed out of the talks because he doesn't want his fingerprints on an agreement that could face opposition from many House Republicans. Republicans, though, had Cantor's back. McConnell went to the Senate floor and echoed Cantor's message. "Either someone on the other side has forgotten that there is strong bipartisan, bipartisan, opposition in Congress to raising taxes or someone is acting in bad faith. We've known for some time that tax hikes would be a poison pill to any deficit reduction proposal," McConnell said after Cantor's walk-out. Responding to a question about a reported split between himself and Boehner, Cantor said at the time that the two GOP leaders were "on the same page." But in a not-so-subtle jab at Boehner's office, the majority leader said, "there wasn't a lot of information that was forthcoming" about the discussions between the president and the speaker pertaining to the so-called "grand bargain," a $4 trillion package of entitlement cuts and new revenues that Boehner took off the table. "I know you all love to write the soap opera here," Cantor joked. CNN's Paul Steinhauser and Deirdre Walsh contributed to this report.